Williams driver Nico Hulkenberg before his crash at the Monaco Grand Prix. (CNN) -- Formula One team Williams have suffered a setback ahead of the Turkish Grand Prix on May 30 after failing to get their updated cars ready in time for the race. Both of the team's vehicles required new parts after drivers Rubens Barrichello and Nico Hulkenberg both crashed at Monaco. But after running out of time to complete the rebuild, the duo will use the old models in Turkey this weekend. 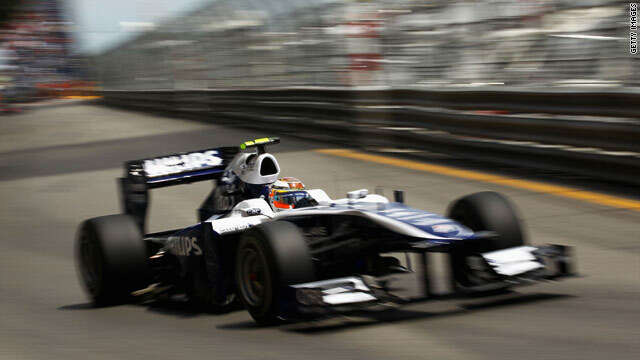 Williams are now hoping to have its new cars ready for the Canadian Grand Prix in Montreal on June 13. "All of the items that needed replacing have been replaced now, apart from the front wings which require more time," Williams technical director Sam Michael told the team's official Web site. "As a result, we have to revert back to a previous specification for this race and wait until Montreal for the updated version." Barrichello and Hulkenberg have mustered just eight points between them so far in a disappointing start to the season for Williams, leaving the team seventh in the constructors' championship. But Barrichello of Brazil is optimistic that the team can turn a corner in Turkey. "I know everyone has been working hard in the factory, so we are all looking to have a much better race in Turkey," he said. "Istanbul is a favorite track of mine. It has a good layout; the corners all flow nicely into each other and that makes it a smooth lap to drive."